On the ides of March a few weeks from now, US aggression in Syria to gain another imperial trophy will enter its 9th year – with no prospect for resolution. Mass slaughter and destruction continue daily by Pentagon-led terror-bombing and US supported terrorists. They’re armed with Western and Israeli heavy weapons and munitions, supplied them cross-border from Turkey, Iraq, Jordan and Israel, along with the Pentagon airlifting them in. Washington’s best laid plans haven’t worked out as scripted because of Russia’s September 2015 intervention to combat US-supported terrorists, notably ISIS and al-Nusra. By no means does this suggest that peace and stability will be restored to the country any time soon. Reality on the ground is polar opposite. Begun in 2012, Russian-led diplomatic efforts in Geneva, Astana and Sochi achieved no major breakthroughs. Afghanistan and Yemen are co-prototypes of ongoing US wars – both begun in October 2001 weeks apart, continuing endlessly with no prospects for resolution any time in the short or intermediate term – why I call them forever wars. The same goes for Iraq and Libya. Formal conflict ended. Violence and chaos continue endlessly, both countries cauldrons of turmoil, mass impoverishment, environmental degradation, and human misery. It’s the legacy of all post-9/11 US wars, a pretext for spending countless trillions of dollars on militarism and warmaking, accounting for the large majority of US discretionary spending at the expense of vital social programs, the nation’s deteriorating infrastructure, and other homeland needs. Wall Street and the military, industrial, security, media complex demand what’s going on. Republicans and undemocratic Dems salute and obey dark forces running the country – the behind the scenes power structure, the nation’s deep state, politicians serving its interests exclusively. Along with 18 or more Pentagon bases in northern and southern Syria, and Turkish wannabe sultan Erdogan’s aim to annex Syrian territory bordering his country, Idlib province remains the last terrorist stronghold. The US, NATO, Turkey, the Saudis, Israel, the UAE and Jordan support thousands of heavily armed al-Nusra and other jihadists infesting the province. Last September, Putin and Erdogan agreed on establishing a 15 – 20 km-wide demilitarized zone in Idlib along the Turkish border. The plan was for Russian and Turkish forces to control it for an interim period, delaying its liberation. Things haven’t worked out as planned. For the past six months, al-Nusra and other jihadists have used Idlib, including the demilitarized zone, as a platform to launch terrorist attacks against Syrian soldiers and civilians. Erdogan betrayed Putin, agreeing to one thing, doing something entirely different, why six months after what was agreed on, things continue festering without resolution. Jihadists move freely back and forth cross-border between Syria and Turkey. Holding civilians in the province hostage as human shields, they’re a more formidable force now than last summer – heavily armed and prepared for battle. Putin erred in trusting Erdogan, who was hostile to Bashar al-Assad, wanting him ousted. The situation in Idlib is untenable. Liberating the province shouldn’t have been delayed. Sunday is the six month anniversary of what Putin and Erdogan agreed on, followed by the latter’s betrayal, one of many reasons why he can never be trusted. In Sochi, Russia, Iran and Turkey agreed that “the military of Russia and Turkey, with the consent of the Syrian government, would try to establish a step-by-step approach, making several areas of joint patrol inside” Idlib. Separately, Putin spokesman Dmitry Peskov said the agreement excludes a military operation. Without it, Idlib can’t be liberated. The latest agreement sounds like more of the same defeatist policy, Putin ignoring Erdogan’s betrayal, letting Idlib fester unresolved, its civilian population remaining hostages as human shields, Pentagon terror-bombing continuing at its discretion, war in Syria raging without resolution. Separately, the Trump regime aims to establish a so-called safe zone in Syria’s northeast, part of its plan to partition the country – the scheme opposed by Russia, supporting the Syrian Arab Republic’s sovereign independence and territorial integrity. 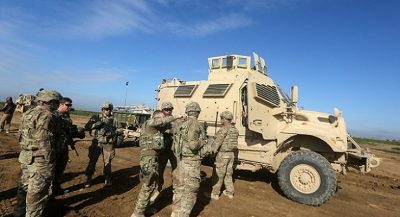 On Friday, hawkish US Senator Lindsey Graham called for deploying EU forces to Syria (over an above numbers already there) – to support Washington’s imperial aims in the country he failed to explain. Erdogan has his own ideas, aiming to establish an illegal 20-mile-deep, 286-mile-long so-called security zone along the length of Turkey’s northern border with Syria. He wants Turkish forces controlling it – part of his scheme to unlawfully occupy, control, and annex Syrian territory, as much as he can get away with grabbing, especially oil-rich areas. The US came to all countries where its troops are deployed to stay. Erdogan has the same idea for northern Syria. Endless conflict in the country continues, perhaps for another eight years or longer – in part because of Russia’s failure to go all out to liberate Idlib together with Syrian forces.